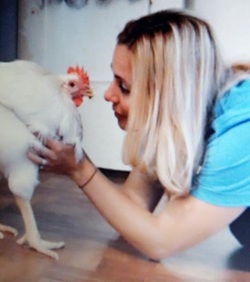 Watch Penelope: A Rescue Story.This sweet chicken was rescued from a Jewish ritual known as Kaporos which is a religious practice that should be outlawed in the United States due to animal cruelty issues and health issues. Please sign our petition to stop this horror (below). May 1, 2016. After watching this video please leave a comment in our comments box at the bottom of this page-we would like to know what you think about this issue. Penelope: A Rescue Story submitted to Youtube by Duncan Skiles. Kaporos is a ritual practiced by some Hasidic Jewish communities (not all) in various parts of the world including New York, New Jersey, Los Angeles, and Jerusalem, as part of the Jewish holiday of Yom Kippur. The ritual involves practitioners grasping live chickens by their wings and swinging them above the practitioners’ heads while reciting a chant about transferring the practitioners’ sins and punishment to the birds, supposedly absolving the participants of their sins. In New York, Kaporos practitioners erect makeshift slaughterhouses on the public streets and sidewalks. Dead chickens, half dead chickens, chicken blood, chicken feathers, defecation, toxins and garbage consume the public streets. There is no oversight or remedy for cleanup. There is no food, water, shelter or compassion for the chickens who typically sit for days locked in filthy transport crates unable to move. 50,000 chickens are trucked to New York each year for this needless ritual which can be practiced with coins or other non-animal tokens and is not required by Jewish law. Plaintiffs in the New York lawsuit maintain that operating such illegal public slaughterhouses creates a public health risk, a public health hazard and a dangerous condition while violating the state anticruelty law. We will keep our readers informed on the progress of this landmark lawsuit. — Karen Davis, PhD, founder, Alliance to End Chicken as Kaporos. ​See updates about Penelope and the pending lawsuits below. On September 14, New York Supreme Court Judge Debra James denied the lawsuit’s request for a preliminary injunction to prohibit Kaporos in Brooklyn in 2015. She denied the request to compel the NYPD and other city agencies to enforce the 15 laws that are violated by Kaporos practitioners. As of now, the case for a permanent injunction continues and the Alliance and other plaintiffs have filed an appeal. In 2015, our case inspired a similar lawsuit in Los Angeles. To learn more about the Alliance to End Chickens as Kaporos campaign, please visit www.EndChickensAsKaporos.com. Every chicken has a story and we want to share them with you. Watch as these sweet abused battery hen's roam outdoors free for the first time in their lives.